For some time, I have been interested in mobile app development, primarily using HTML 5 technologies. The interest started with BlackBerry's Playbook Offer, and to get a free PlayBook, I developed the free PlayBook application TimeDiff which was interesting experience for me. Long story short, I had a real nice hands-on experience with jQueryMobile (the mobile version of jQuery) a neat framework to create touch-screen friendly applications. And I wanted to share some plugins with you that I found useful. Codiqa: This is something that I actually did not use for the development of TimeDiff, but I found it very useful for a start. Codiqa, located at http://www.codiqa.com/, is a very nice web-based UI to create a jQueryMobile based applciation. It has an online designer that you can create and preview your application with different device sizes. DateBox: DateBox is a very nice set of plugins to add Date / Time pickers to your jQueryMobile application. Not much words needed, check out the demos here to see how many great stuff you can do with the DateBox. Before my last words, you can take a peek at my application from here and get it for your PlayBook from the BlackBerry App World. 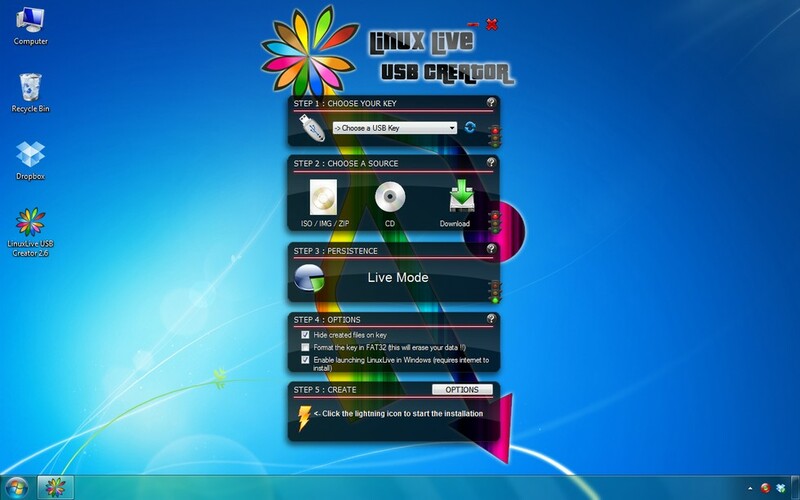 Today I am going to review a simple, yet quite strong application: Linux Live USB. LiLi is a simple application that allows you to turn your USB flash disk into a fully working Linux distribution. It is written for Windows (sorry for Linux users that want to try other Linux distro's) and is distributed under GPLv3 license. The GUI is easy to understand. You simply choose your USB key that you want to install your Linux distribution on. Then you choose the installation source which can be a CD or an ISO image. You can even choose LiLi to download your favourite distro. If you have enough space on your flash disk, you can even add a persistent storage that Linux will treat as an hard disk. When you are done, you simply click the fancy lightning button and in a few minutes you have your fully working operating system on your USB, that you can easily take anywhere with you. Good enough? Not heard the whole thing yet. You can simply select to embed VirtualBox into your USB disk, and you have your OS even when you are working on Windows. If you select the VirtualBox option, the USB key gets an autorun feature to run directly as you plug. Unfortunately, this is also for Windows only. Not only the GUI is fancy.. You should also check out LiLi's web site http://www.linuxliveusb.com/ which has one of the coolest designs I've ever seen. Hopefully everything (hyperlinks and syntax highlighting) is back in its place in this new blog, so I'll be moving on to write code snippets here..
One of the reasons that I like C# and Python (together) is the feeling that they are converging to each other. How I ended up with this conclusion? Well, I have just learned that C# (and not only in .NET Framework 4.0 but starting from the 2.0 version) has a way of declaring named and optional function arguments.. This quite sounds familiar to me: from Python as you might expect. I have a strong guess that Python had it earlier (even though I am not sure) but it is not the issue. Whoever had it before, somehow moved the other one forward.. That is what is going on with the modern and developing languages and I actually like this (kind of) competition. It helps the developers learn new programming languages and develop projects faster after getting familiar to the syntax..
* and adapted to me for use like a plugin from jQuery. overlayBgColor: '#000',  // (string) Background color to overlay; inform a hexadecimal value like: #RRGGBB. Where RR, GG, and BB are the hexadecimal values for the red, green, and blue values of the color. fixedNavigation: false,  // (boolean) Boolean that informs if the navigation (next and prev button) will be fixed or not in the interface. containerResizeSpeed: 400,  // (integer) Specify the resize duration of container image. These number are miliseconds. 400 is default. // Configuration related to texts in caption. For example: Image 2 of 8. You can alter either "Image" and "of" texts. txtImage: 'Resim', // (string) Specify text "Image"
txtOf: '/',  // (string) Specify text "of"
keyToClose: 'c',  // (string) (c = close) Letter to close the jQuery lightBox interface. Beyond this letter, the letter X and the SCAPE key is used to. keyToNext: 'n',  // (string) (n = next) Letter to show the next image. // Hime some elements to avoid conflict with overlay in IE. These elements appear above the overlay. // Call the function to create the markup structure; style some elements; assign events in some elements. // We have an image set? Or just an image? Let´s see it. // Instead to define this configuration in CSS file, we define here. And it´s need to IE. Just. // Show some elements to avoid conflict with overlay in IE. These elements appear above the overlay. * @return Array Return an array with x,y page scroll values. Hi all, In a previous post, I mentioned that I will challenge myself for writing Dijkstra's algorithm with minimum lines of code. The C# code is here as promised. Now first of all, this is possibly the worst implementation that can be done; and the only intention was to really do things in a short way in terms of Number of Lines used. The code is not maintainable and not even readable. Well, the trick comes from maintaining only a distance array and calculating all other stuff wherever required. My first version of this code was 8 lines (I was separately holding a list of nodes that was not reached) but then I realized that it was possible to calculate it using the distance array each time. Before going into the code let me introduce you the basic idea of the algorithm as I implemented. As previously mentioned all edges have positive costs. Also we assume that the graph is connected. Let N be the nodes, i the source and j the sink node, A the distance matrix. Enumerable.Range(0, A.GetLength(0)).Where(l => dist[l] == -1.0). And now a much more efficient implementation of the same thing without recalculations. I don't ever say that it is efficient, but it is just more efficient. The best way would be maintaining the both lists outside of the while loop and removing and inserting necessary elements before continuing. I'm not an expert on music nor have any education on recording technologies etc. I am not an audiophile (and not rich enough to be one). I just love listening to music, and love listening it loudly. Today, I was driving and experienced something that bothered me for so long. It was just my car's FM player and the song was something that I have never heard of (and I don't remember it right now, low quality popular music:) Then there were 3 beats, played on left-right-left speakers consecutively muting the other one. Bu blog'da yayınlanan tüm yazılar Creative Commons Attribution-NonCommercial 3.0 Unported License ile lisanslanmıştır.